Dark circles under eyes is a common beauty ailment that gives you tired, exhausted and premature aged look. The skin around your eyes is very thin and delicate which makes these dark circles even more prominent. Aging, skin dryness, dehydration, working for long hours in front of a computer, lack of sleep, mental or physical stress, smoking, heredity, poor diet and lack of nutrients are some common causes behind dark circles under eyes. Although there are various treatments available to get rid of these dark circles but many of them are quite expensive and unaffordable for everyone. 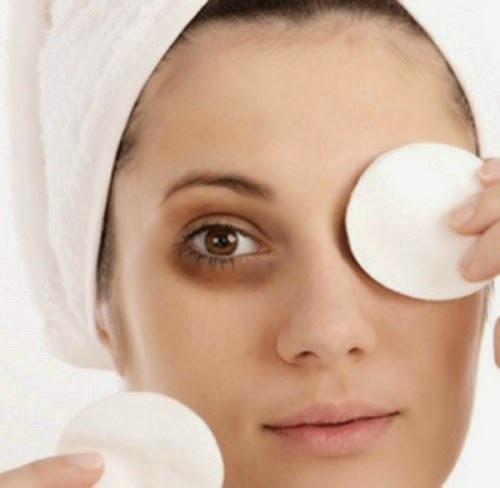 Luckily here in this article we are going to share some best natural home remedies to remove dark circles under eyes. Cucumber has been shown excellent results in getting rid of dark circles under eyes. Take 2 fresh slices of cucumber and keep them in the refrigerator for about 30 minutes. Now, place the cucumber slices over your closed eyes for about 15 minutes and then remove them and wash your eyes with fresh water. Alternatively take equal amounts of cucumber and lemon juice and dip 2 cotton balls in this mixture and apply on your closed eyes for about 15 minutes and then wash off. This simple home remedy is also very effective to diminish the appearance of dark circles under eyes. Potato is a natural skin bleaching agent and helps a lot in getting rid of dark circles under eyes. Take two fresh potato slices and place them on your closed eyes. Let them stay for 15-20 minutes and then remove. Alternatively 1 teaspoon of potato juice and mix with equal amount of lemon juice. Apply this under your eyes with help of a cotton ball of brush. Leave for 15 minutes and then rinse off with fresh water. Take 2 used tea bags and place them in refrigerator for 20-30 minutes. Now apply them over your closed eyes. Remove them after 20 minutes and then wash your eyes. Regular application will give you an amazing result within few days. Note: If you have dark circles along with eye bags and puffy eyes then use of caffeinated tea bags (black or green) is excellent for you but if you have simply dark circles but no puffiness under eyes then use of caffeine-free tea like chamomile tea tea bags is perfect for you. A combination of mint leaves paste and tomato juice is also very helpful to cure dark circles. Make about 1 tablespoon paste of mint leaves and mix with 1 teaspoon of tomato juice. Apply it on the affected areas under eyes. Leave for about 15 minutes and then wash off. Regular application of this remedy will remove the dark circles under eyes. this paste with 1 teaspoon of lemon juice. Apply this paste on your dark circles. Let it say for about 20 minutes and then rinse off with fresh water. Take 2 cotton pads and soak them in cold milk. Now apply them on your eyes for about 20 minutes. Milk not only deeply moisturize and cleanse your skin but also helps a lot in lightening the appearance of dark circles under eyes. Regular application will give you an excellent result within few days. Tannic acid present in apple is very helpful in lightening dark circles under eyes. Take one ripe apple and cut this into thin but large slices. Place two slices on your closed eyes and leave there at least for 20 minutes before washing off. Alternatively you can also apply a paste made from boiled green apple. Take one green apple and boil this until top layer becomes soft enough to make its paste. Now apply this paste to your dark circles and leave for about 20-30 minutes and then wash off. Application of avocado slices under eyes also helps a lot in diminishing the appearance of dark circles. Cut 2 slices of ripe avocado and place them over your eyes for about 20 minutes. Alternatively you can also apply avocado oil under your eyes to eliminate dark circles. For best results apply avocado oil on a daily basis and see a remarkable improvement within few days. Sweet almond oil is an other effective way to treat dark circles under eyes. You can gently massage the area under eyes with sweet almond oil. Leave at least for half an hour and then rinse off. For best results apply this before going to bed and rinse off next morning. Besides reducing dark circles under eyes, this simple home remedy is equally effective in reducing the appearance of fine lines and wrinkles around eyes. To get rid of dark circles under eyes take 1 teaspoon of orange juice and mix with 1/2 teaspoon of glycerine. Apply this around your eyes and leave for 20 minutes. Finally wash off with fresh water. Regular application will give you an amazing result within few days. Lactic acid in buttermilk gently exfoliate skin to give it a natural glow. The acidic and astringent properties of buttermilk helps a lot in reducing the discoloration under eyes. Anti-inflammatory and antioxidant properties of turmeric help to remove the dark circles. Take 2 teaspoons of buttermilk and mix with 1/4 teaspoon of turmeric powder. Now apply this paste on affected areas under eyes and leave it on for about 15 minutes. Finally wipe it off with a clean and damp cloth and wash off with lukewarm water to remove turmeric stains. Take 1 teaspoon of tomato juice and mix with 1/2 teaspoon of lemon juice and a pinch of turmeric powder. Mix all the ingredients and carefully apply on your dark circles. Leave for 10-15 minutes and then remove by using damp cloth and finally wash off by using lukewarm water. For best results, repeat this on a daily basis. (i)Try to drink 8-10 glasses of water on a daily basis to prevent dehydration because dehydration may lead to emergence of dark circles. (ii)Avoid Smoking because smoking leads to constriction of blood vessels. This leads to poor circulation of blood which makes the under eye darkness more prominent. (iii)Sometimes lack of certain nutrients like iron and Vitamin E, may also lead to dark circles. To prevent their deficiency try to eat more foods rich in iron and Vitamin E .
(iv)Skin dryness and lack of moisture may also lead to dark circles under eyes. Before going to bed, don't forget to apply a good moisturizer around your eyes. If you don't have a good moisturizer you can simply apply almond or coconut oil. (v)Avoid working till late night and try to sleep at least 6-8 hours because lack of sleep can also lead to formation of dark circles under eyes.